I can literally think of over 100 ways to save money right this very minutes: cutting back on discretionary expenses like dining, entertainment and vacations, bargain shopping for big-ticket items likes cars and couches, turning your thermostat down/up at night when sleeping, utilizing store coupons and reward programs for discounted prices, and reviewing your budget monthly in order to better plan your future purchases. But the easiest day-to-day, fool-proof, no-brainer advice I can give to cut costs is to grocery shop at Aldi. I don’t mean stop by after work to grab their bacon-wrapped filet mignon 2-packs for $3.99 for a cheap steak dinner date or to run in on your way to little league to pick up pre-packaged individual granola bars for $1.79 a box. I mean to literally shop at Aldi on a regular basis as your main grocery store. You’ll save 30-50% compared to your regular grocery store right out of of the gate, with no coupons ever required. I know, you’ve got a ‘but’ opposition to my suggestion. Everyone does. But don’t you have to pay to rent a cart there? But I can’t buy everything there. Bagging your own groceries is ghetto. But they don’t have good produce. But they don’t have the name brands I buy. I’ve found that the dissenters, for the most part, are simply looking for an excuse to kill time while trying to really figure out why they aren’t shopping at Aldi already. Look, if you don’t need to save money on your grocery bill or if you have limitations that keep you from going, or if you just don’t want to, it’s all good. But if you really want or need to save money and aren’t because you’re scared of change, you’re slowing your own roll. Yes, you put a quarter in the cart when you walk in the door, and take the quarter back when you leave the cart. Big whoop. You can’t buy everything anywhere, same as with Aldi. They carry about 1400 of the quickest-moving grocery items, plenty to choose from if you have the slightest bit of flexibility. Bagging your own groceries and bringing your own bags is the same as stowing your own luggage on the airplane and pumping your own gas at the station. It’s the way of the world. Self-checkout is available and encouraged at most every major grocery store in the country. Aldi’s produce is top notch and has stricter standards than most major grocery stores, so you’re getting the freshest, ripest food around, at literally half the price of other stores. To me, the produce is one of my favorite reasons for shopping at Aldi. It’s fresh, it’s abundant, there’s tons of options, including organic, and I save about $25/week on produce alone in comparison to Jewel, Mariano’s, Kroger, Albertsons or Winn-Dixie! Aldi occasionally features some name-brand foods, but the majority of Aldi’s food is private label, which is made of the same or higher quality foods as national brands. All you have to do is try it…the proof is in the taste. It’s that easy. Food is food. Buy your food at Aldi, where it costs less. Today I got cucumbers for $.29 each and 2 bags of baby carrots for $.49 each, a bottle of private label Prosecco for $4.99, and a 12 oz loaf of fresh gluten free bread for $3.99. It can’t get easier than that. Take it from me, who spends under $100 for my weekly food bill for a family of 4 at Aldi. As a family, we pack lunches every day, eat at home for dinner, and take our own snacks when we’re out and about. The same foods used to cost me $165 at Jewel-Osco. Or take it from my Aldi tester friend, (insert any name here, as most of my cohorts now shop at Aldi) who shops for a family of 6 on a weekly basis, traditionally spending about $250-$300/week at a large chain grocery. 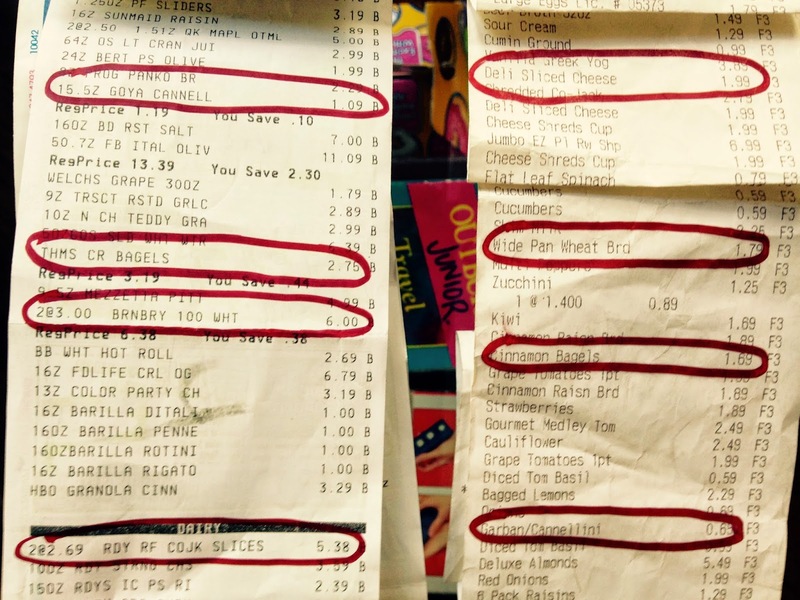 When she shops at Aldi for the same food and quantity, she usually spends between $150-$200. She has officially made the switch! 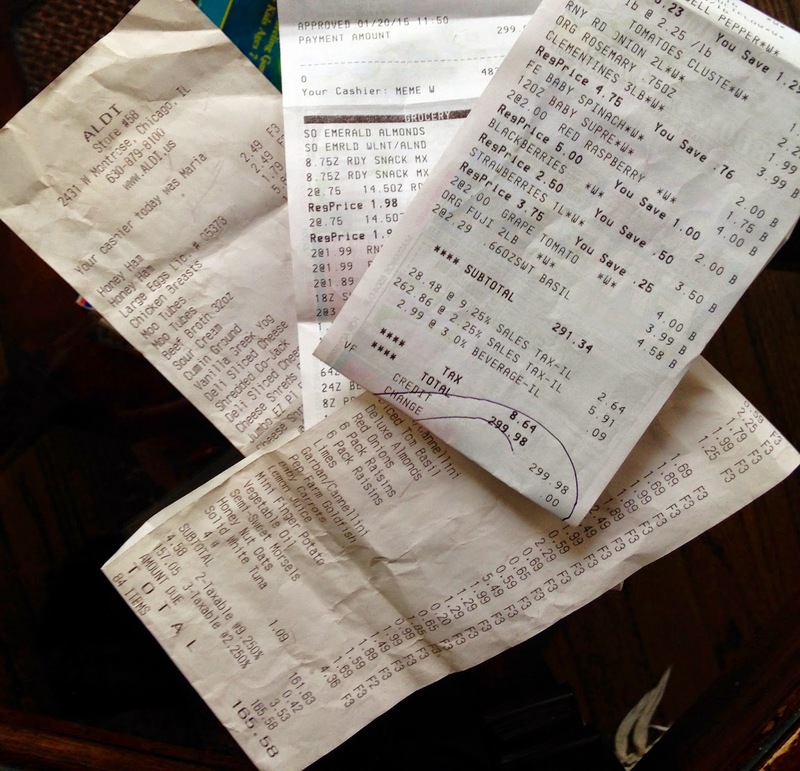 Check out her competing receipts for a review. While not all items listed are “apples to apples” price comparisons, the few that I’ve highlighted are MAJOR price differences for the exact same sizes and ingredients. If you save on nearly every item you buy at Aldi in comparison to your national chain grocery, how on earth could you not consider shopping there?